When you buy the clams and/or mussels, if you are not going to use them immediately, keep them in the refrigerator wrapped in a damp cloth. Do NOT cover them with plastic or put them into a plastic bag or they will suffocate. Discard any shells which are open or cracked. They day you are going to cook the clams and/or mussels, scrub the shells under cold running water. Then mix together 100 grams of non-iodized salt per 1 litre of cold water and cover the clams with this salted water for a minimum of 20 minutes and up to 4 to 5 hours in the refrigerator so that they filter out any sand or grit. Any shells which float to the surface should be discarded. 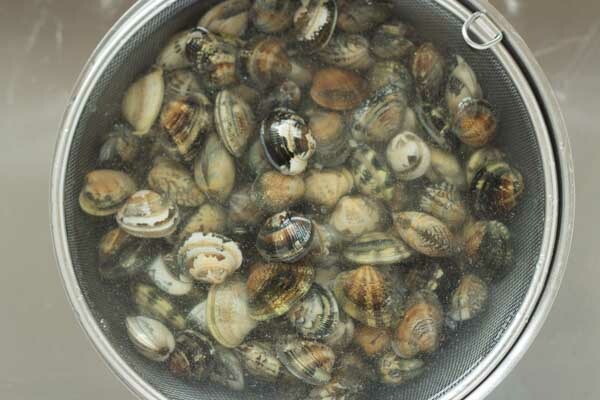 Remove the clams and/or mussels from the water and place in another bowl and add clean water. Scrub the shells of the clams to remove any grit and discard any clams that are still open or have a broken shell. Change the water continually until the water is clean and free of grit. Do not place the clams and/or mussels into a colander and run water over them as they will not filter the water and the grit will remain trapped inside the shell. Keep the clams on the side, drained of water, covered with the damp cloth. For mussels, use a tea towel to hold onto the beard and rip it out from the shell pulling along the shell.